In 1927, the New York Yankees absolutely crushed their opposition, virtually "cake walking" to their second World Championship with a climatic 4 game sweep of the Pittsburgh Pirates. The dynamic duo of Babe Ruth and Lou Gehrig led this unparalleled squad, with their record setting assault on the fences eventually leading to the "Bambino's" unfathomable 60 home runs. 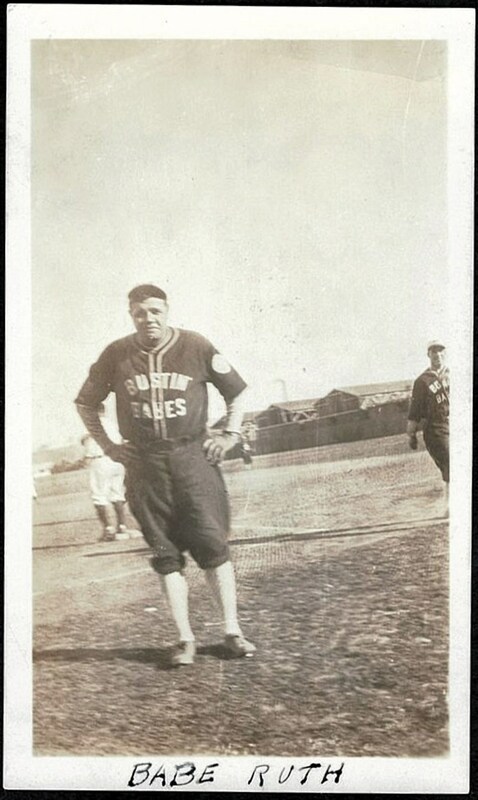 Virtually every American was now captivated by these incredible sluggers, which prompted Ruth and Gehrig's renowned agent Christy Walsh to organize a Continental U.S. tour directly after the 1927 World Series. 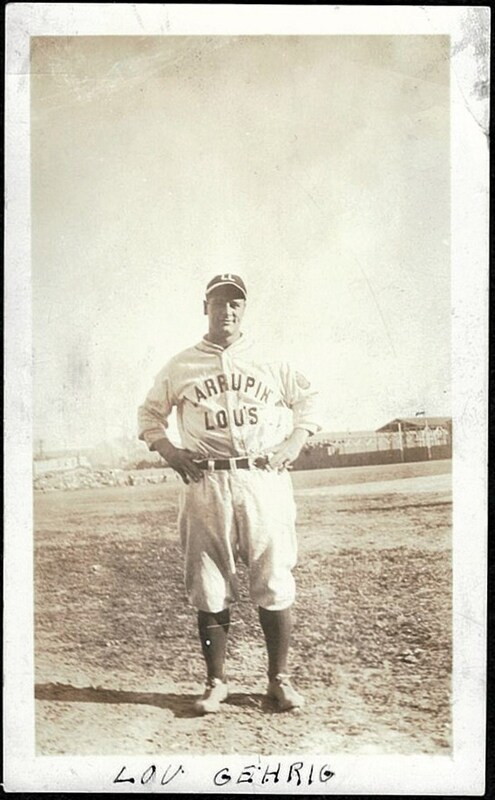 Dubbed the "Bustin' Babes and Larrupin' Lou's Barnstorming tour, Ruth and Gehrig would play in towns/cities without Major League ball clubs in order to provide deprived fans a grand opportunity to see these legendary giants. 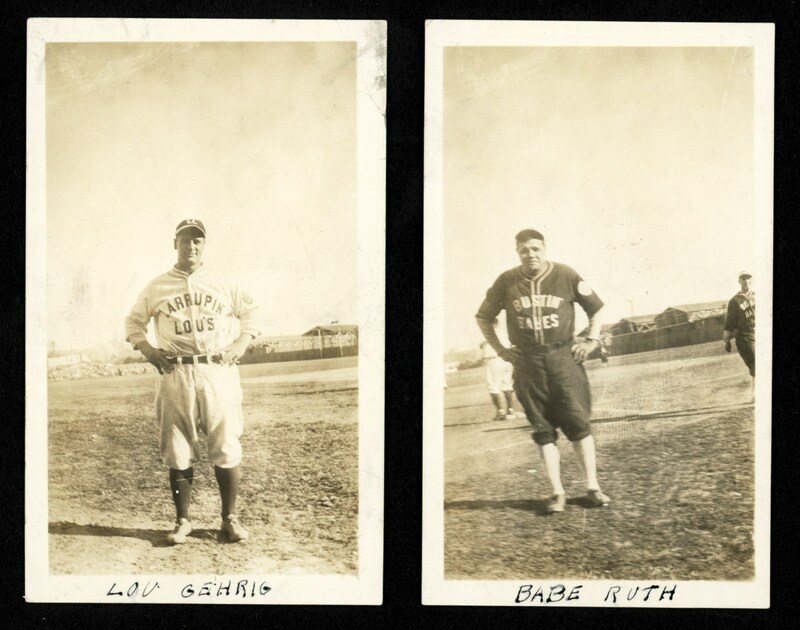 Starting in New York and sweeping across America to the California coast, Ruth and Gehrig would be the sole Major League players, with each respective town providing local players to round out the teams. Both young and old admirers of these baseball icons were afforded their "once in a lifetime" opportunity to see the two Yankee stars perform live, and the tour was such a huge success that it was repeated in the fall of 1928 and 1931. 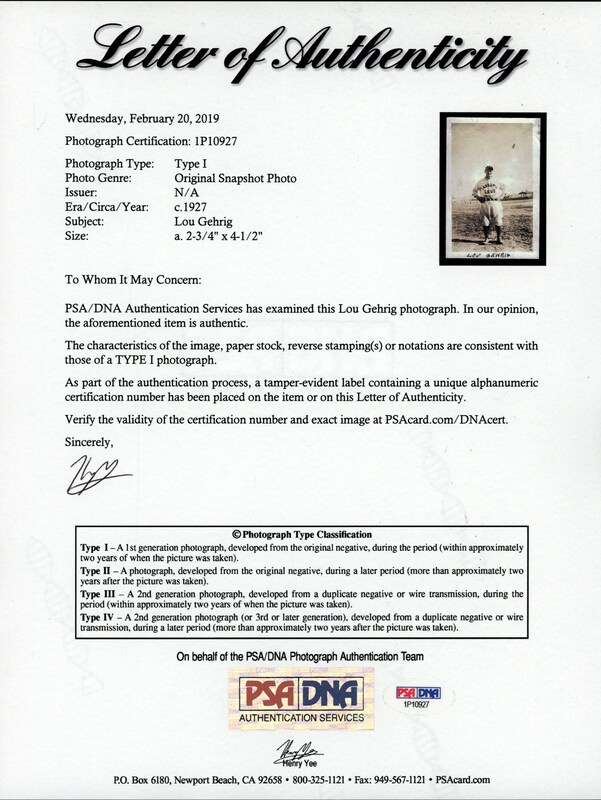 Presented here are two spectacular PSA Type 1 photos of Babe Ruth and Lou Gehrig from the 1927 barnstorming tour that was issued 10 days after the Yankees swept the Pirates in the 1927 Fall Classic. 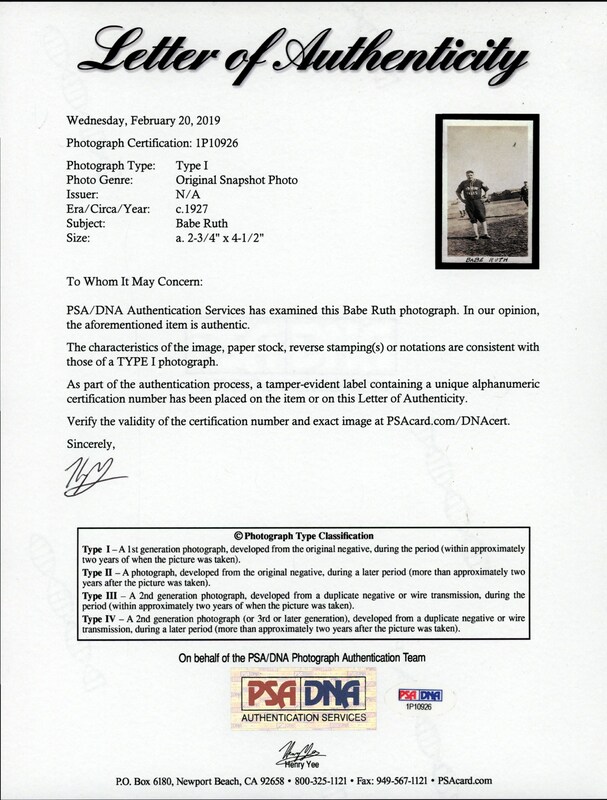 Measuring approximately 2-3/4" x 4-1/2", both images were taken at Stockyards Baseball Park in Sioux City, Iowa by photographer Harold "Hy" Albeck on October 18, 1927, portraying Babe Ruth and Lou Gehrig in their classic "Bustin Babes" and "Larrupin Lou's" uniforms. 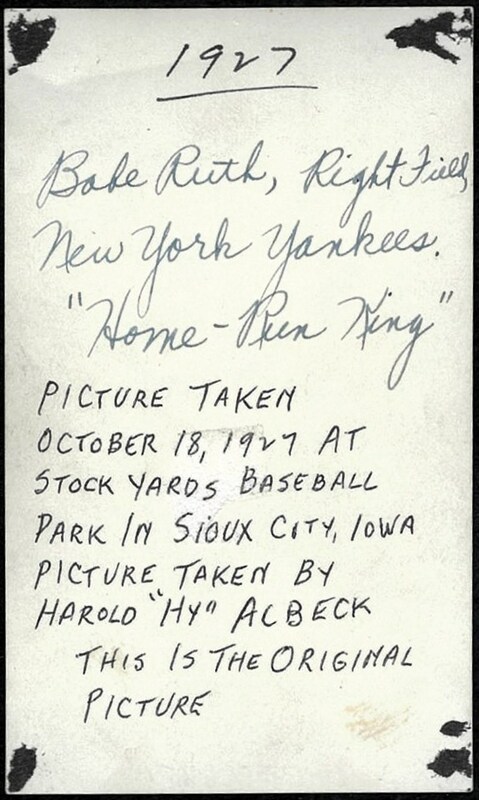 The 13-year old Albeck actually skipped a day of school to see these legends perform at Stockyards field, bringing his period style "box camera" to the game to take these revered photos (see the other Ruth/Gehrig image from this photo shoot presented on the same page in the catalog). 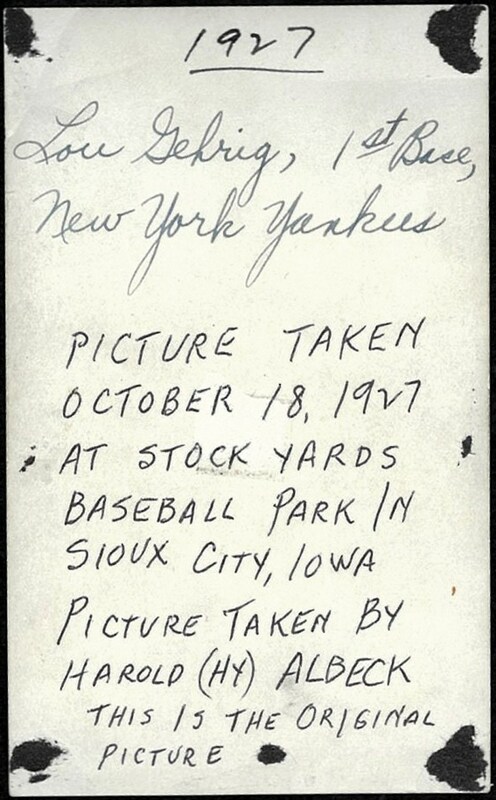 The remarkable snapshots of "The Babe" and "Iron Horse" literally transcend time, and you can virtually "turn back the clock" and place yourself at this local Sioux City field where these two baseball icons displayed their majestic power to an adoring mid-west fanbase.